HomeOur BlogGoodbye Hawaii, Aloha World. Since I was a young girl, I had a healthy curiosity for worlds unknown to me. When my 2nd grade teacher told the class that as Americans, we lived a life filled with conveniences and opportunities that most of the world lived without, I was not only shocked, I was intrigued. Basic daily amenities I wouldn’t even think twice about, were considered luxuries for others across the globe. Later, I would spend hours on the floor of my dad’s office, paging through glossy volumes of National Geographic Magazine, trying to see and understand other cultures. It was unfathomable to me that people in other parts of the world could live such different lives than the one I was accustomed to. Fast forward a few years later, I was lucky enough to experience a taste of life abroad. I won a scholarship to study art in Germany for a summer. A few years later, I saved up for a month with my best friend exploring all of Italy. Visiting these places opened my eyes even wider to how vastly different the outside world was and only made me long to travel further, longer, and deeper. When I met my husband Jason, we both immediately clicked on our passion for traveling. It was something that was important to us both, and that we wanted to prioritize. Jason had worked in Greece and Korea in his early 20s and similarly to me, wanted to experience more. Well, we met in our mid-twenties and are currently heading into our mid-thirties, and not much traveling the world has been done. 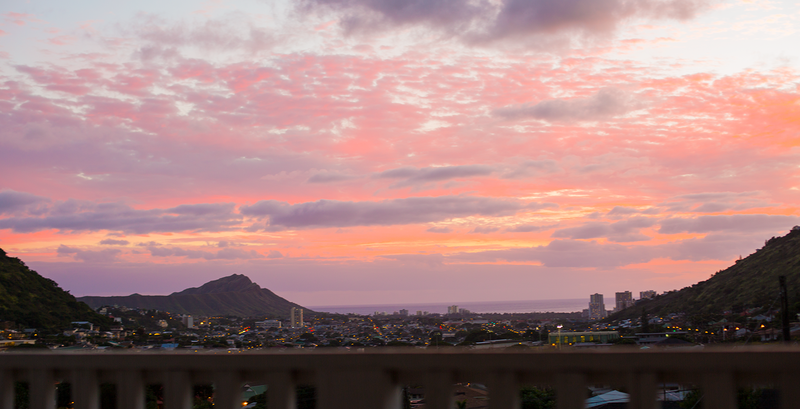 Instead, we have worked our butts off to create a dream life in Hawaii. This was certainly not for nothing. We are surrounded by amazing friends, a tropical home that 8 years later still takes my breath away – daily, and a life full of magic and adventure. But especially in Hawaii, the grind of working a demanding job and attempting to live the American dream of getting the house, the baby, etc…. was pushing our dream of traveling further and further out of the picture. That’s when, 2 years ago, we made the decision to put “life” on hold and start saving for a year of traveling abroad. Now, my left brain is scared shitless… it is asking me WHY am I leaving a job that pays well that I enjoy? WHY am I leaving Hawaii, a place that I have wanted to live all my life and worked and struggled so long to finally become financially comfortable. WHY am I, at 33 years old, taking what appears to be a leap back in life when others are getting mortgages and having babies and saving for their future? And where will I land when this grand adventure is over? If I were to tell you that these questions don’t freak me out, I would be lying. Saying “Good Bye” to the view from the lanai of our humble home in Palolo Valley, Oahu. My right brain on the second hand is freaked out about the prospect of NOT taking this time to check off some major life goals. I’ve read a lot of inspirational quotes ( ;P )… and basically what I can surmise from them, is that when I am on my deathbed at the ripe old age of 103, I will most regret the risks I did not take. I mean, I promised myself when I went to Italy in 2007 I would travel abroad every few years, and in what feels like the blink of an eye, 10 years have gone by. 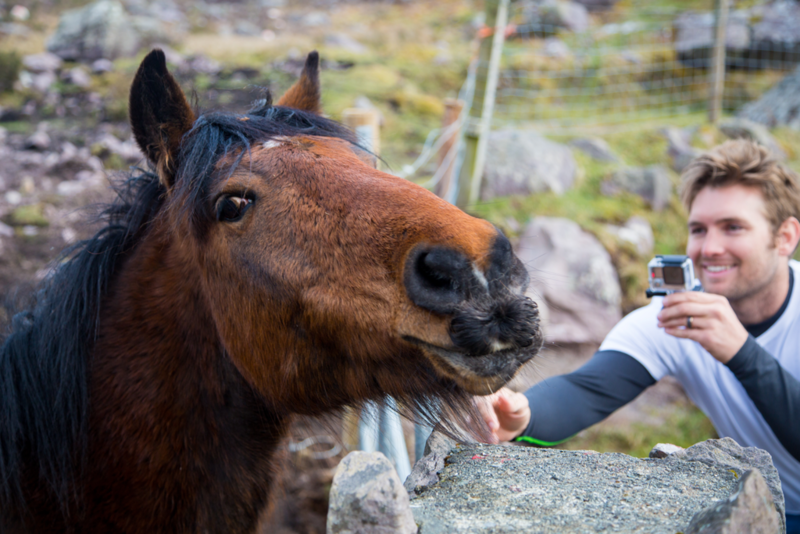 Pony loving at the Gap of Dunloe in Ireland. And so, the last 2 years have just been a series of steps. Each step taking us closer and closer to our goal of traveling abroad for a year. We downgraded our living situations, took jobs on different islands, picked up extra work and have been able to scrimp and save. What seemed to be something that was so far away, was gradually becoming more and more of a reality. Now suddenly, we find ourselves homeless, jobless, and on the brink of what I hope will be the best decision of our lives together. A few months ago, hiking the Himalayas, riding a camel through Egypt, taking a cooking class in Thailand, and motorbiking through Vietnam seemed like someone else life, not MY life. But now, only a few weeks out from taking off, I can barely contain my excitement. We hope that you will follow along with us on all of the adventures and missteps that are in store. We decided to write this blog so that all of our friends and family can see what we are up to. We also hope we can inspire others to take that leap of faith, in whatever endeavors interest them. 4 Comments on "Goodbye Hawaii, Aloha World." So exciting! Can't wait to follow you! Fabulous, thrilling, daring, exhilarating, scary, and just overall SUPERLATIVE! I'll be hanging on every word! Love to both and keep writing! Thanks so much for the kind words! We appreciate it!